It’s very foggy and drizzling this morning. The good news is it looks like some clearing is forecast for the end of the week with some hot sunny days. This is the first year I remember weather affecting my mood but I understand many experience seasonal affective disorder this time of year. Our May gray/June gloom days are created when the land warms up and the ocean is still cool. These conditions usually occur in late spring and early summer but we may see the pattern in fall as well. We like to complain, but this weather pattern helps keep our weather mild. When it gets hot we complain too. We are a little spoiled in Santa Barbara. This weather affects our plants as as well. With less sun and light some of our vegetables, annuals, and other plants do not grow as fast as we’d like. The high humidity, moderate temperatures, and low light intensity promote conditions that some fungal disease such as powdery mildew thrive in. On the other hand, watering chores are less. My containers simply are not drying out at their usual rate. Its hard to believe it may be 80 degrees in a few days. See you at the beach! It has been a great spring and the roses have never looked better. The blooms were big and bountiful. But now the first show is over and the next step is important if you want a good repeat bloom. We want the roses to perform all summer. For this we need to set up a routine of feeding every four to six weeks. Working the fertilizer into the soil and top dressing with a mulch to help keep the sensitive surface roots cool as we move into warmer weather. If your roses are on a drip, be sure to hand water the fertilizer in with a good deep soak. And remember to always pre-water the day before you feed. Never feed a dry plant! Roses are not fussy about what you use to feed them. They just need to be fed on a regular schedule with a good balanced diet. I prefer organic methods, which nourish the soil and allow the rose to become stronger with all the nutrients available in the soil. As for pruning and deadheading, this is where you can determine the height, size and shape of your bush. You always want to prune to an outward facing leaf that is pointing in the direction that you want the next stem to grow. The reason for pruning to an outward bud is to direct the growth away from the center of the bush, which will improve air circulation and prevent canes from growing into each other. When you have decided how low you want to prune, look for the first leaf that has five leaflets. Make your cut at a 45 degree angle, slanting down and away from the emerging bud eye and about 1/4″ above the leaf axle. If you are working on a hybrid tea rose, they bloom on a single stem, so it is pretty straightforward. With a floribunda, the flower is on a stem in a group of three or more buds. They bloom in succession, one after the other. 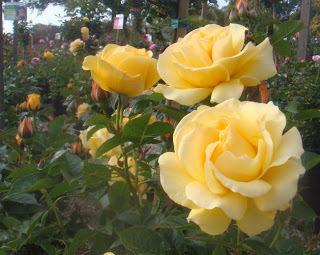 With this type of rose, you can nip off each flower as it fades, or wait until the whole stem blooms out. Then remove them all at once. Also keep in mind that it is not a good idea to put your clippings into the compost pile. Disease and insects can survive and re-infect. And there is nothing like coming in contact with a rose thorn that didn’t quite compost down. So bag and toss your trimmings into the green waste can. The main thing to keep in mind is that roses are very forgiving. What mistakes you might make are not going to hurt your rose. They will survive and bloom anyway. If you don’t deadhead, your rose will look messy and stall before blooming again. 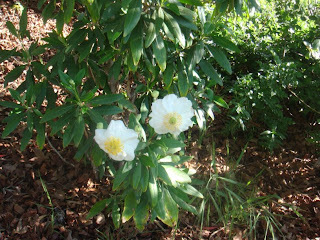 The process of pruning away the spent blooms triggers a response in the bush to re-bloom faster. So by pruning and feeding regularly, you should have another round of beautiful blossoms in a few weeks to share with your friends and neighbors. The question we get asked most in the nursery is “how often should I water this plant? The problems we most often see in the nursery are often associated with over or under watering. For a long time I have wanted to write a handout on watering but it’s a daunting task. There are so many things to take into consideration. What are the water requirements of the plant? Is the plant in a pot or in the ground? What watering system is being used? What type of soil do you have? How old is the plant? How many hours of sun does it receive? What is the temperature and wind situation on that given day? What month is it? Sometimes when people ask me how often to water their container plants I’m afraid I sound condescending when I say, “water a dry pot but do not water a wet pot”. In fact that is exactly how we try to water all the plants we have in the nursery. For today I am confining my thoughts to landscape plants in the ground. Fortunately the Sunset Western Garden Book and two of my favorite websites Native Sons and San Marcos Growers are full of great information. We always tell people to water even drought tolerant plants until they are established. But what does this really mean? Sunset says, “This may be a single season for a perennial, up to 2 to 5 years for a tree.” Sunset lists the water requirements for every plant. It’s important to group plants with similar requirements together. Native Sons gives good advice for our area the Central Coast. These recommendations apply to the dry (no rain) months of the year. Regular Water = weekly, or every 3-4 days if it’s very hot or windy. Infrequent= DEEP water every 4-6 weeks in summer. I would also like to stress the importance of deep water for our trees, shrubs and other permanent landscape plants. Deep watering encourages deep roots, which allow the plants to go for longer periods between watering. Shallow watering keeps roots close to the surface. They are unable to cope during hot, windy periods. Another thing I’d like to mention is watering systems. Drip and other water saving systems do help to save water. They may be great on established plants. On new plantings we want you to be able to flood the entire root zone. Sometimes basin watering to start a plant may be best. It is also important that any system you are using can be adjusted for the needs of different groups of plants. We are all busy putting in our spring veggie gardens, or redoing our landscapes before summer vacations but we don’t want to forget to take time to check out the magnificent California landscapes “Mother Nature’s Garden”. Some of the most beautiful countryside you will see anywhere in the world is in our own backyard. Last weekend my husband and I (along with our dogs) went for a little spring drive up Alisos Canyon Road to Foxen Canyon. At every turn in the road each and every view was more gorgeous and awesome. The hillsides were bathed in Blue Lupine and huge patches of Purple Vetch. We saw Queen Anne’s Lace, Shooting Stars, Indian Paintbrush, Sticky Monkey Flower, Gilia, Miner’s Lettuce, and Owl’s Clover, just to name a few. It was a wonderful bright sunny day and with the windows down you could hear the song of the Meadowlarks as we slowly cruised by. As we drove by the fields of grape vines I couldn’t help but wonder about the enormous job of pruning those thousands of vines, all perfectly done. What a lot of work. If you bring your pooches: leashes, water and poop bags. Don’t wait too long. This show does not last forever. Relax and enjoy. Many of us in Santa Barbara have problems with fungus. We see diseases such as Rust, Blackspot and especially Powdery Mildew. Powdery Mildew loves warm days and cool damp nights, pretty typical south coast weather, spring to fall. The best control is preventative: plant in full sun with good air circulation. Modern roses with glossy foliage seem to be more resistant. We recommend a preventative spraying program to prevent disease especially if you have had problems in the past. The use of a hose end or other sprayer that allows you to direct under and over the leaves is best. Do not spray in the heat of the day. Three products we like are Organicide, Neem Oil (Rose Defense) and Paraffinic Oil (Year Round and All Seasons). These products smother fungal spores as well as as sucking insects such as aphids. Organicide is derived from sesame oil. Neem oil is formulated from the Azadirachtin Tree. The “ultrafine” type Paraffinic oils form a barrier, coating the leaves so fungal spores don’t settle. Of course this advice is not just for roses. If you had trouble last year with other plants ornamentals or edibles, preventative spraying may be a good idea for you. Finally the roses are at bud stage and beginning to bloom. We have waited all winter for this time to arrive because as we all know the first bloom cycle is the best: big, bold, and beautiful. Bragging rights for all who pruned sprayed and fed. But even if time got away from you and you were not able to complete routine annual maintenance, roses will still produce the most glorious blooms on the first flush. Next come the foggy days which may bring mildew, rust, and don’t forget the bugs. Roses have their own special insect problems. But don’t lose heart, we have answers for most every problem and we try very hard to keep it organic. The first problem you will likely see is aphids. They are soft bodied sucking insects that enjoy the tips of your beautiful new rose buds. They may be green, yellow, orange or black and in their early stage have wings. They are easy to spot and deal with using organic solutions. The next common damage we see are leaves that have been eaten into lace. This is the work of the rose slug. This little critter is on the under side of the leaf and looks like a little green inch worm. It is actually the larvae of a sawfly wasp. You will probably never notice the wasp. You must direct your spray underneath the leaves. You can keep the solution organic with Spinosad and have great success. Now that our rose field is open feel free to come and wander. Please remember the field is closed every Wednesday for maintenance. Every day new roses are showing more color. The big news is the La Sumida Rose Field will open Saturday 3/29/08. 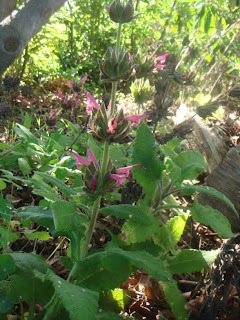 I am enclosing pictures of blooming California Natives this week. From top to bottom: Bush Anemone, Hummingbird Sage, Douglas Iris hybrid, and Island Bush Poppy. Spring seems to be in the air and everyone is ready for planting. The summer garden may be started now. You can begin your veggie garden with cool season tomatoes like Early Girl and Stupice. Lettuce, peas, chard and herbs can can be planted. You may want to wait a week or two before planting cucumbers and eggplant. 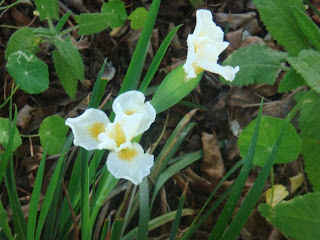 As for summer color, you can begin putting in your perennials and anuuals. This is a good time to prune back your leggy shrubs and tropicals. They will come back with the warmer, longer days. Pruning, planting and feeding are what spring is all about. Also weeding, cleaning and planning. It’s very important to remember to go through your garden and empty anything that might be holding water from the rains. Mosquitos are a big problem. The larvae wigglers are hatching out now. So be aware. Walk around your yard or patio and empty any containers and water holding objects. There is a lot to do, so remember: the garden doesn’t have to be put together in one day or weekend. You can add to it all summer long. They were inaccurate. The plant in the picture was not a Scotch Broom as they said. Instead of going to management for accurate information their source was our newest (two weeks) employee in training. Their caption made it sound like La Sumida is unaware and doesn’t care about the environment. We have worked very hard to help our customers to be responsible and considerate of the environment. We all need to be aware of the footprint we leave behind. We have been busy in the nursery gearing up for the “spring rush”. Warm season bedding color, vegetables, and herbs are arriving weekly. 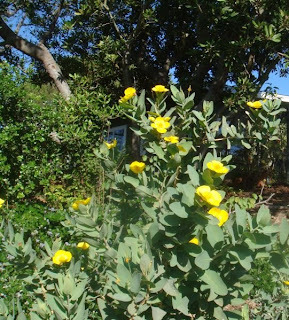 We have a lot of beautiful Australian shrubs in bloom in the Sun Section. Come see the Tea Trees, Wax Flowers, Grevillias, etc. We love them all. Yes, tomatoes are here. Unlike many of our chain competitors, we do not put them out in February. We want your tomato growing to be successful. When nights are too cool tomatoes tend to succumb to blights and other disease. While April and May are the best months for planting tomatoes we know you want to get started. I like to put in “early” or “cool season” tomatoes to start. Some favorites are Early Girl, Stupice, and Sungold Cherry. Sunday March 9 is the date for our popular tomato seminar. There are two sessions: at 10am and 1pm. Typically the morning session has been more crowded. Judi and I will both be there so don’t forget to say hi. Ok, I know that last week it was hot and we had temperatures close to 80 degrees. It felt like spring was here. Everyone was asking me, “where are the impatiens?” And “why don’t you have the tomatoes yet?” This is Santa Barbara; don’t we only have one season? Can’t we plant anything, anytime? No, we can’t. It’s February. This week it’s cooler. The nighttime temperature can still drop into the 30’s again. When you are tucked into your nice warm bed (with the heater on), the plants outside are dealing with frosty nights, cold soil, foggy mornings and maybe sunny days. Cold-tender plants like, tomatoes, squash, peppers, eggplant, cukes as well as bedding plants like begonias and impatiens will suffer with the cold soil and cool nights. It retards their growth pattern and subjects them to disease, like Early Blight and other fungus problems. So even though you will find the summer veggies available elsewhere, try to hold off. Just a few more weeks of preparing your beds and waiting until the soil is warm and the weather is stable makes a huge difference to the health and productivity of you plants later this summer. They will take off so much faster when you plant them when both the soil and air temps are warm.We will have all the warm season veggies the first week in March. And don’t forget, we will have our annual tomato class, March 9. Learn everything you need to know about growing the best tomatoes you can.Be patient, we have all summer. Get out and enjoy the sunshine, listen to the birds and pull a few weeds. The tomatoes are coming!!! P.S. If the buds have not opened on your fruit trees you still have time for one more dormant spray.